Should We Be Using The Word No In Dog Training? You are here: Home / Training / Should We Be Using The Word NO In Dog Training? People often disagree as to whether or not we should be dog training using the word NO. We communicate with our dogs through signals. Some of these are visual signals, a raised hand, a swing of the arm, a pointing finger. All have one thing in common. They tell the dog what we want him to do. With one exception. And that is the word NO. In human language the word NO is fundamentally important. It conveys how we feel in a very clear way. By dog training using the word NO, we can express dislike, disagreement, refuse permission, and make decisions. We all know what the word means, though its meaning can be complex and is often related to context and emotion. Because this word is so important to us, it is only natural that we use it with our dogs. Is NO relevant to dog training? It may be natural to say NO to our dogs, but is it helpful? Force free dog trainers don’t use the word NO at all. This can be confusing for the majority of dog owners, who use it in all kind of situations. It can feel very powerless when told not to do so. It is tempting to assume that if you don’t say NO to your dog from time to time, he will be the equivalent of a spoilt child, with no discipline and no clear boundaries. But is this really true? And why don’t force free trainers use it? We’ll have a look at that below. First let’s look at the four ways that we use NO when communicating with our dogs. Remember that punishment in the behavioural sense does not mean cruelty. It simply means something that diminishes behaviour. So if the word NO stops your dog in his tracks, you are using it as a punisher. This only works with sensitive dogs that are very keen to please. For example, say one of my Labradors is asked to pick up a ball that is lying on the ground to her right, and instead tries to pick up a ball lying on the ground to her left. I can say NO in a disapproving tone, and she will immediately stop in her tracks and switch to the ball I want her to get. I might not like to admit it, but what I just did was punish her. A force free trainer would have the dog on a long line and prevent her getting to the wrong ball. They would then wait for her to decide to pick up the correct ball, and reward her for doing so. In the long run, this is probably more effective as it makes the dog think more about what she is doing. It also probably makes for a better relationship between dog and handler as it avoids upsetting the dog or making her feel that she has let the handler down. We often talk about event markers in dog training. We nearly always use an event marker to both tell the dog he got something right, and to predict that he will shortly receive a reward. It is possible to use NO as an event marker. To tell the dog he got something wrong, and to let him know he is about to be punished. Once the marker is associated with punishment, it can temporarily be used to diminish behaviour without using punishment afterwards. However the key word here is temporarily. Just like a conventional event marker, the punishment marker soon loses its power if not regularly backed up by actual punishment of some kind. 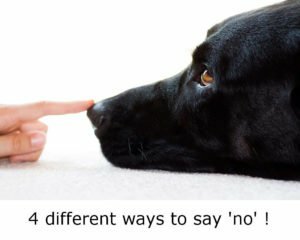 Many, many people try dog training using the word NO in this way, and wonder why it stops working when they stop punishing. This is perhaps the most popular use of the word NO. We exclaim NO! Or Ah-ah! In a snappy, firm way and the dog pauses to see what we are on about. In that interval, we can then re-direct the dog into a preferable activity. Many force free trainers would argue that we are actually still using NO as an aversive. If the dog stops the behaviour, they would say, then your actions were actually a form of punishment. Strictly speaking they are probably right. Conventional use of an interrupter would involve the dog being taught a word that was associated with a reward. Many of us do this by making a kissy sound, or a waggoner’s chirrup, or even teaching a magic word. In every case, the sound needs to be firmly associated with a nice reward in order for it to effectively interrupt the dog’s behaviour. It is also possible to use NO as a No Reward Marker. This simply tells the dog he made the wrong choice. If you ask your dog to fetch a ball and he fetches a shoe, you could simply ignore him and wait for him to drop the shoe and get his ball. Or you could very calmly and in a completely neutral way, say ‘NO’. Arguably the word NO gave him information that helps him to make the right choice more quickly. The use of NO as a No Reward Marker has fallen out of favour. Partly because it is so difficult to say NO in a completely neutral and non threatening way. One way to make it more neutral is to replace it with a visual cue, like a head shake or a thumbs down. One of the underlying principles of force free dog training, is that the focus is moved from teaching the dog what he should not do, to teaching the dog what he should do. Force free trainers focus on giving dogs cues that provide him with a specific path to follow. Most of the time, when we use NO, we are probably using it as an aversive, albeit a very mild one. Trying to combine mild aversives, with positive reinforcement training can be counter-productive. It’s all too easy to fall back on aversives, and for aversives to escalate and become more severe. There are also downsides to training with punishment, even mild punishment and you can read about these here: The downside to punishing dogs. I know a lot of people worry that if they abandon that final and most mild of aversives, the word NO, they will somehow lose all control over their dog. There is no evidence whatsoever to suggest this will happen. Of course, force free training is a skill, and it is one that we have to learn. But arguably we could all learn faster if we allowed that last aversive to be peeled from our grasp. If you are worried about the effectiveness of positive reinforcement training generally, this is the article you need: The evidence for positive reinforcement. We humans have a very long association with the word NO. We tend to use the word with great emphasis, and it is often accompanied by powerful body language. If you are capable of over-riding that and using NO in a completely neutral way, you might be able to use it as a No Reward Marker. If you are happy to use mild punishment in your dog training session, and you have a sensitive dog, you may find dog training using the word NO is a useful mild form of correction. I don’t recommend NO as an event marker as the need for associating it with punishment will never truly go away. And there are much better ways of teaching an Interrupter. For many of us, the word NO is the ‘final aversive’. The last barrier between us, and force free training. If you want to learn how to train completely without force, you might want to try and manage without the word NO. But be aware that the use of the word NO is a powerful habit. People who really want to abandon it can get very upset with themselves when the word ’slips out’. It is great that you want to be nice to your dog, but no healthy dog ever came to any harm from being told NO occasionally. Just start afresh tomorrow. You’ll get there. And feel free to comment on dog training using the word NO, in the comments box below.